Daniel Tilles examines a new plaque placed alongside the infamous Jewish ritual murder painting in the Sandomierz Cathedral, proposing that the plaque represents both a sign of positive progress and a missed opportunity to offer a more honest appraisal of a dark episode in the history of the town and the Catholic Church in Poland. In the Middle Ages, the Polish lands were often a haven for Jews escaping persecution in the West, but the myth of Jewish ritual murder arrived from other parts of Europe to take a strong hold among some members of the clergy, who encouraged its spread through the broader population. Tilles offers a critical assessment of the Polish Church’s recent attempts to come to terms with this history, while giving credit to those within the Church and beyond who have sought to further the cause of positive Jewish-Catholic relations in Poland. In April 1698, the dead body of two-year-old Małgorzata was mysteriously deposited in a church mortuary in the Polish town of Sandomierz. Her mother, when summoned to explain the child’s death, testified that she had died of illness. Her explanation was accepted by the court, which meted out a mild punishment for failing to ensure that the child’s body was properly buried. The matter would normally have ended there; but the court’s judgment was rejected by the Bishop of Krakow, causing the investigation to be reopened. Now, under torture, the mother suggested that on the Tuesday before Divine Mercy Sunday she had given Małgorzata’s dead body to a Jew, Aleksander Berek. However, when confronted with the accusation, Berek produced witnesses who confirmed that he had not been in Sandomierz on the day in question. Consequently, the mother changed her testimony, claiming that she had made mistakes. She had, in fact, given her child to Berek on Thursday, not Tuesday, and her daughter had been alive at the time, not dead. One may wonder why, if the mother admitted to giving inaccurate statements, mistaking a fact as important as whether her child was dead or alive, the case proceeded any further. But proceed it did, and the Crown Tribunal in the nearby city of Lublin, to which the case had been transferred, had an ingenious solution to resolve these inconsistencies: more torture. The mother reiterated her story that Małgorzata had been alive when she gave her to Berek, adding that the body had then been returned to her dead, with visible wounds and its eyes missing. Berek, however, despite protracted and brutal torture (later described in gruesome detail by a priest who was involved in the prosecution), refused to confess to the crime, and denied completely the suggestion that Jews used the blood of children for ritual purposes. Nevertheless, both he and Małgorzata’s mother were found guilty and sentenced to death, with Berek’s head nailed to a stake and his body quartered and hung in the street. The case of Małgorzata is typical of the blood-libel charges – false accusations that Jews murdered Christian children and used their blood for ritual purposes – which periodically emerged across Europe, beginning in twelfth-century England and, by the seventeenth and eighteenth centuries, occurring most frequently in the Polish-Lithuanian Commonwealth, which housed Europe’s largest population of Jews. Indeed, Berek had not been the first Sandomierz Jew to fall victim to such charges, and nor was he the last: twelve years later, when the body of another child, Jerzy Krasnowski, was discovered, a local rabbi was blamed for his death. Three Jews were executed for their alleged involvement, with a number of others, including the rabbi, dying in captivity during the proceedings. 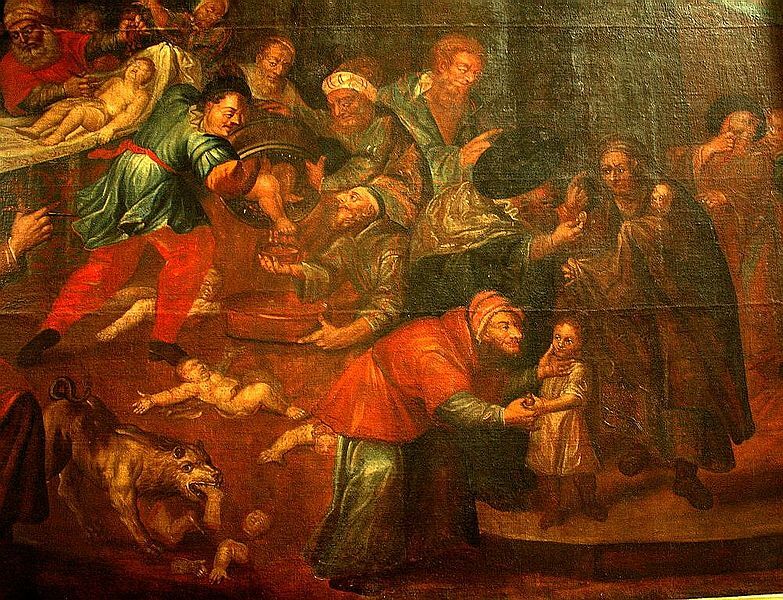 Painting of “ritual murder” by Karol de Prevot in Sandomierz Cathedral. 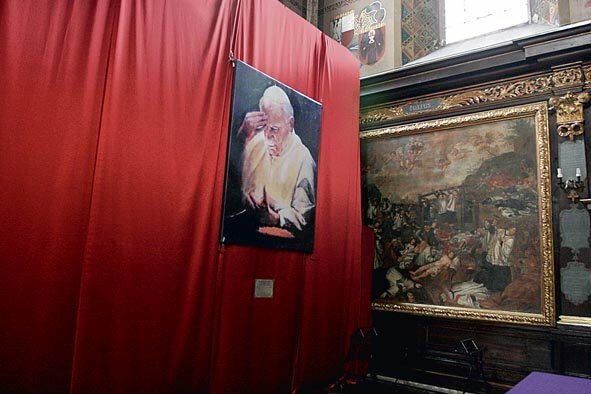 Under the glare of such scrutiny, a decision was made in 2006 to remove the painting from public display, and for the next eight years it remained hidden behind a curtain and a pointedly placed portrait of John Paul II, the Polish pope celebrated for his efforts to encourage Polish-Jewish dialogue. Then, at the start of this year, the painting was returned to public view. The unveiling took place on the Polish Catholic Church’s “Day of Judaism.” The choice of date, however, was not as inappropriate as it may first seem – for a decision had been made to place alongside the painting a plaque containing text – in Polish, English and Hebrew – that provided some explanation of its content. 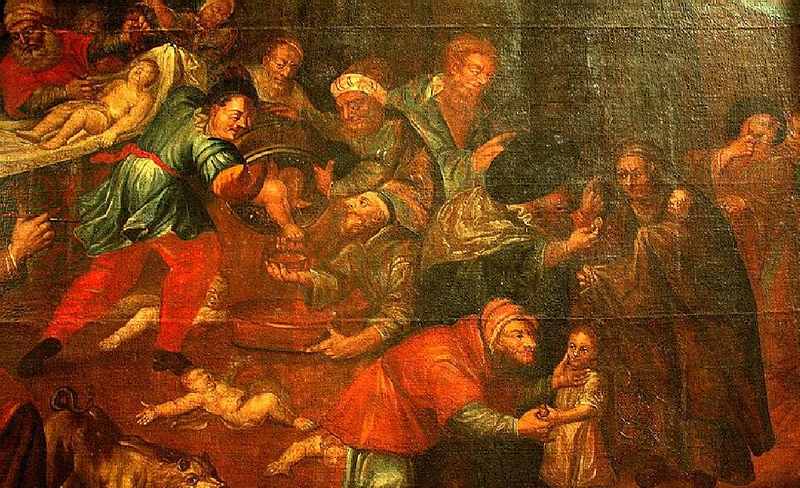 This painting depicts a ritual murder that the Jews of Sandomierz allegedly carried out in order to add the blood of a Christian infant to the matzah they baked for Passover. This event controverts historical truth and, what is more, could not have taken place because the laws of Judaism prohibit the consumption of blood. Jews could not and did not carry out ritual murders. On account of similar accusations they were often persecuted and killed, which also happened in Sandomierz. From the thirteenth century on, popes forbade spreading such false accusations and protected Jews against them. The new plaque next to Karol de Prevot’s painting of “ritual murder” in Sandomierz Cathedral. It should be recorded, first of all, that the plaque does represent progress of a kind. Most obviously, it unambiguously refutes the blood-libel myth. This is no small matter in a country where, according to a recent survey, 23% of people believe that Jews have historically been involved in kidnapping Christian children (with such a belief most heavily concentrated in two regions bordering Sandomierz); where within living memory such allegations helped trigger widespread anti-Jewish violence (most infamously in Kielce, 90km from Sandomierz, where 42 Jews were killed after being accused of kidnapping a nine-year-old boy, but also in Rzeszów, Kraków, and elsewhere); and where updated forms of the blood libel still appear in certain spheres of public discourse. 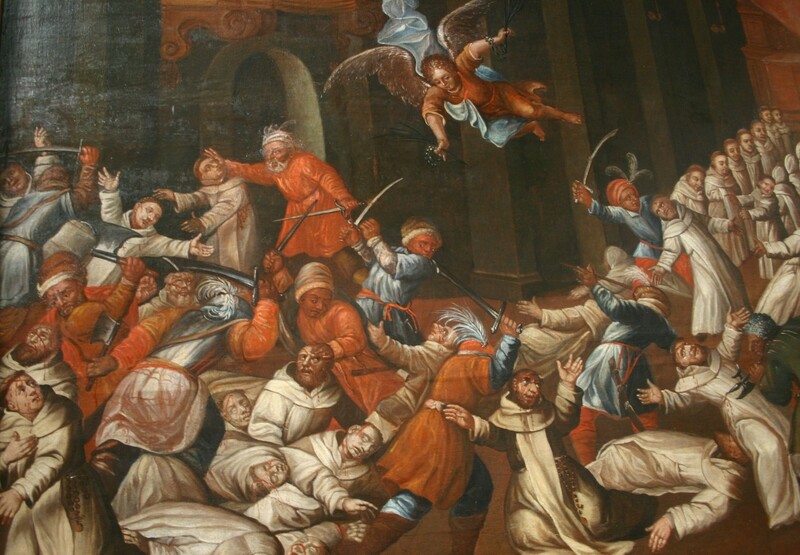 Moreover, as Tokarska-Bakir has demonstrated, the residents of Sandomierz itself retain, to this day, a deeply ingrained attachment to the myth – exemplified by a cathedral tour guide, who describes the ritual-murder painting to visiting groups as “documentation of an event that was true.” In this context, drawing attention to the pernicious mendacity of the blood libel, and doing so in a permanent plaque alongside the image in the cathedral, which is visited by hundreds of thousands of tourists a year, is a worthy aim. There are, however, two respects in which the plaque’s text is lacking, one a distortion of history, the other an omission, and both concerning the involvement of the Church in this dark passage of Sandomierz’s – and Europe’s – history. Yet, as the historian Marina Caffiero has demonstrated, Ganganelli’s findings represented “an isolated opinion” within a church hierarchy that tolerated, and at times actively encouraged, the blood libel. In particular, it did so by endorsing the veneration – and even passage to martyrdom – of alleged child victims of ritual murder, around whose memory local anti-Jewish cults often developed. This was the case with Pope Sixtus V’s canonization, in 1588, of Simon of Trent, a two-year-old boy alleged to have been ritually murdered by Jews a century earlier. (Simon was removed from the Calendar of Saints by Pope Paul VI in 1965.) In 1755, Pope Benedict XIV went even further, not only sanctioning the veneration of Andreas of Rinn, another alleged child victim, but undertaking a broader attempt to affirm the validity the blood libel, writing that both Andreas and Simon had been “butchered in the cruellest fashion…by Jews out of hatred towards the Christian faith”. As Caffiero concludes, the “convenient and reassuring belief” that there was some “tradition of the Church” that “systematically denied…the blood accusation” is no longer tenable. Woodcut from the Nuremberg Chronicle (1493) depicting the “ritual murder” of Simon of Trent. As well as glossing over the mixed legacy of the papacy with regard to the blood libel, the plaque’s second, and perhaps more serious, deficiency is its complete failure to acknowledge the specific role that the Church played in the episodes that took place in Sandomierz. For the curious observer, certain questions may spring to mind when reading the plaque. It states tersely that blood-libel accusations “happened in Sandomierz” – but when and how? And who was responsible? 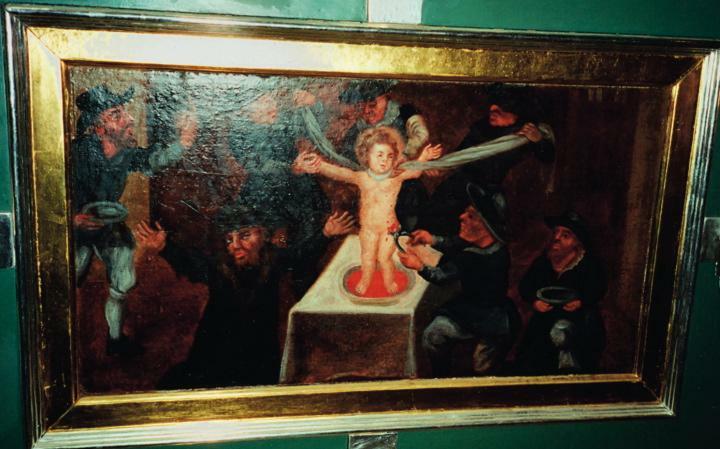 Moreover, if, as the plaque makes clear, blood-libel accusations were dangerous falsehoods that caused great harm to Jews, then why was this painting displayed in a cathedral, as part of a series of images purportedly depicting historical events? And if “popes forbade spreading such false accusations and protected Jews against them,” why did the church in Sandomierz deliberately disobey their commands? While the answers may be uncomfortable, they are important ones to confront. The picture is located in the cathedral because it was commissioned in the eighteenth century by Stefan Żuchowski, a powerful church figure in Sandomierz and the wider region. He was the priest, mentioned above, who played a prominent part in the prosecution of Aleksander Berek in 1698; twelve years later, he took the leading role in initiating and conducting the ritual-murder trial arising from Jerzy Krasnowski’s death. After both cases he published books on the subject, which became influential in perpetuating belief in the blood libel in Poland and encouraging further accusations to be made against Jews. Żuchowski was rewarded for his efforts by being appointed commissioner for Jewish affairs by the diocese of Kraków, allowing him to pursue further cases against Jews – an indication that the Polish Church not only tolerated the blood-libel myth but positively encouraged it. This was reflected in the fact that a number of senior church figures were prominently involved in pursing the spate of blood-libel cases that struck Poland over the first half of the eighteenth century. In Kraków, Bishop Kazimierz Łubieński had suggested during the Jerzy Krasnowski case that all the Jews of Sandomierz be tortured in order to find the culprits. His counterpart in Lutsk, Antoni Wołłowicz, was instrumental in ensuring the retrial and conviction, based on forced testimony given under torture, of an alleged Jewish child-murderer who had initially been found innocent. Wołłowicz informed the papal nuncio in Warsaw that there were “many and great proofs of cruelty towards Christian blood…in this kingdom by the perfidious Jewish nation.” Kajetan Sołtyk, the Catholic bishop of Kiev – like Lutsk, today in Ukraine but at the time part of the Kingdom of Poland – oversaw a ritual-murder trial that resulted in the execution of twelve Jews, and was responsible for the production of publications designed to confirm the authenticity of the blood libel. Indeed, of the various antisemitic tracts relating to alleged Jewish ritual murder published in Poland, the majority were the work of Roman Catholic clergy. The situation became so unbearable for Poland’s Jews that a petition was made to the pope in 1758, beseeching protection from the “vexations, imprisonments, extortions, torments and deaths” they were facing as a consequence of ritual-murder accusations. The man charged by the Vatican with investigating the situation, Cardinal Ganganelli, after concluding that blood-libel charges were completely groundless, expressed his sympathy for Jews, those “unfortunate creatures” who were forced to live in “fear in Poland, where the prejudice of the Christians against them is great.” His report, as well as the outlawing of torture in 1776 and the discomfort many Polish nobles felt about blood-libel cases, appears to have been behind their diminution over the second half of the century. A small plaque is not, of course, sufficient to do full justice to this complex, difficult and disputed history. Yet even so, it is not unrealistic to expect that a text explicitly created to explain the historical context of the painting should do something to acknowledge the fact that the Church played such a central role in that history. 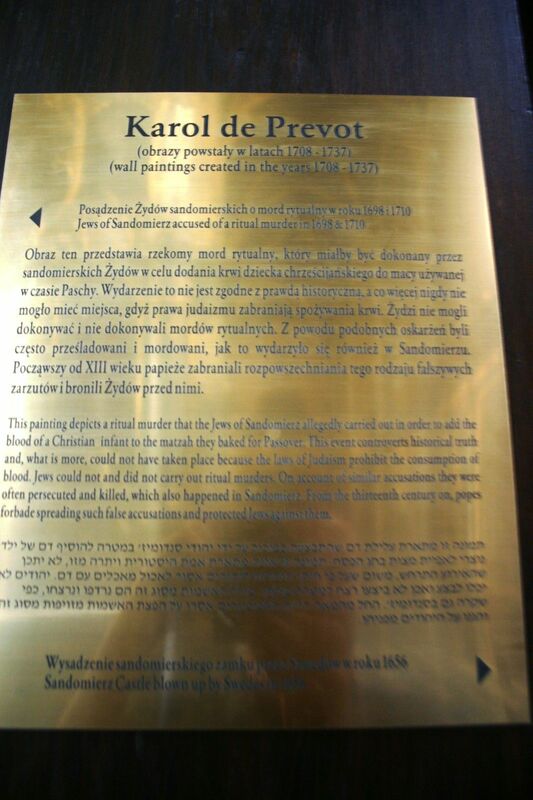 Moreover, while today’s Church bears no direct responsibility for events that took place three centuries ago, it is not unreasonable to hope that the plaque could include an expression of remorse for its past role in what remains a particularly painful feature of Polish-Jewish collective memory. 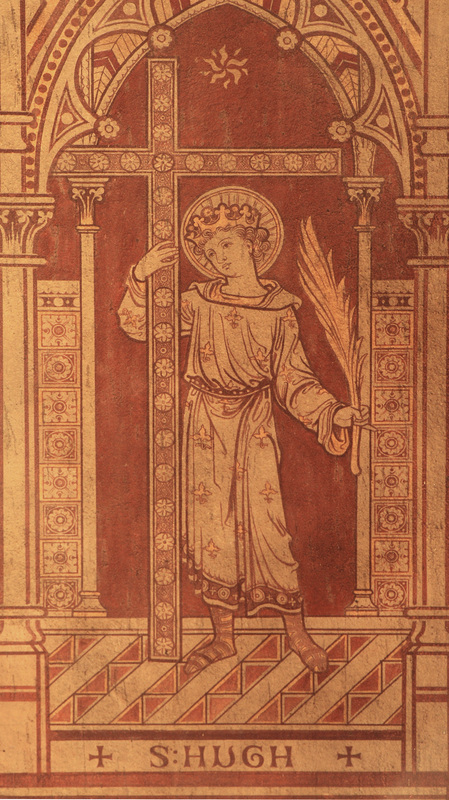 Little St Hugh of Lincoln. Trumped up stories of “ritual murders” of Christian boys by Jewish communities were common throughout Europe during the Middle Ages and even much later. These fictions cost many innocent Jews their lives. Lincoln had its own legend, and the alleged victim was buried in the Cathedral in the year 1255. Such stories do not redound to the credit of Christendom, and so we pray: Lord, forgive what we have been, amend what we are, and direct what we shall be. The addition of a similarly succinct acknowledgement of regret would do much to enhance Sandomierz’s plaque. The Polish Council of Christians and Jews, who were involved in the protracted discussions over the creation of a plaque, initially suggested that the text should end with a quotation from Pope John Paul II, expressing that the “Catholic Church, guided by the evangelical principle of truth and love, and not by any political considerations, deeply regrets hatred, persecution and manifestations of antisemitism whenever and wherever they met Jews from the side of Christians.” Yet not only was this idea rejected, but the committee appointed by the Bishop of Sandomierz to consider the text of the plaque attempted to water down the eventual statement even further, by adding claims that the “Church opposed the dissemination” of blood-libel accusations and that “Jews in Poland were legally protected, and even possessed many privileges.” While containing grains of truth, both statements clearly misrepresent events in Sandomierz. Painting from Sandomierz Cathedral depicting 13th century Tatar attack on Sandomierz. 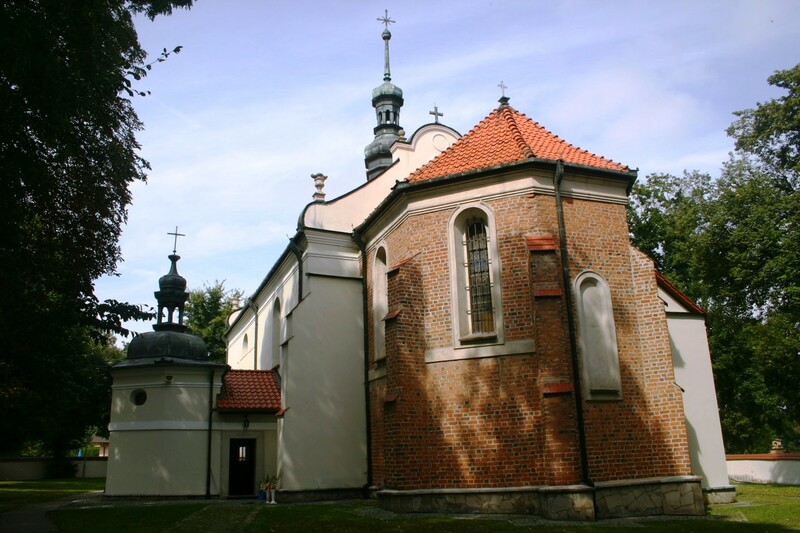 The Church of St Paul in Sandomierz. Yet whatever faults one can find with the treatment of the cathedral’s painting, an even more troubling situation exists a ten-minute walk away, in St Paul’s Church. 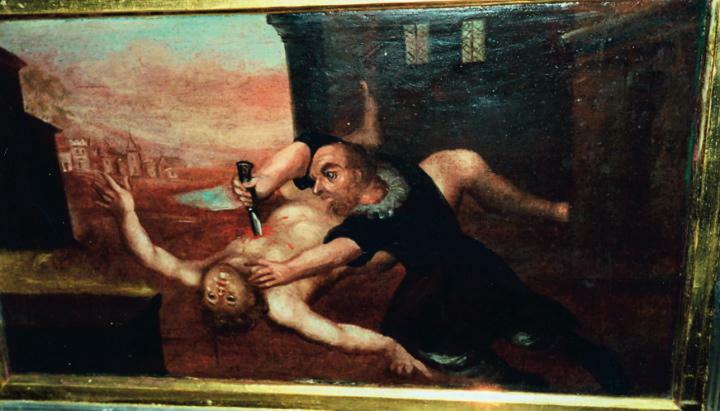 There, a set of eight ritual-murder paintings, far cruder and more immediately repulsive than the single, faded image in the cathedral, is displayed prominently around the church’s chancel, showing Jewish figures engaged in various forms of torture and murder of Christians (two examples here and here). As far as I am aware, no explanatory plaque of any kind is present. During my own visit, the nun watching over the church had been extremely welcoming on my arrival; but, once it became apparent what I had come to see, the mood perceptibly soured, and it was made clear that my interest in the paintings was not welcome. As a smaller church with far fewer outside visitors, the St Paul’s images have received much less attention than the cathedral’s; but their continued presence is perhaps more telling. While in the cathedral the church authorities have responded to widespread criticism by first concealing the painting and then adding a plaque, at St Paul’s, where there is far less pressure to act, nothing has been done. In this light, it is tempting to see the action taken in the cathedral as a reluctant concession, or a public-relations exercise, rather than a genuine effort to deal with this aspect of the town’s and the Church’s history. Image from chancel of the Church of St Paul in Sandomierz. This leads, finally, to the question of what should be done to improve the situation. In his article fourteen years ago, Father Musiał declared that for Sandomierz’s blood-libel paintings – both in the cathedral and at St Paul’s – to remain in place, even with an explanatory inscription alongside them, would be an “to insult human dignity.” Instead, he suggested they be relocated to a specially created museum of antisemitism in the town, where they could be viewed and understood in a “clear context, unmarked by ambiguity, outside the sacred space.” My own feeling is that the sacred space in which the paintings are located is, in fact, essential to their understanding: how they came into being, the events they are associated with, what they represented at the time of their creation, why they remain important artefacts today – honest answers to all such questions must take into account the Church’s role, and removing the paintings from their original context risks obscuring an essential aspect of their history. Equally, however, there is a strong argument in favor of removing objects that are so offensive and painful to Jews – and should be to Catholics as well. In a country where the authorities are quick to enforce laws against “offending religious feelings” when Christianity is the religion in question – even in instances as trivial as a pop star being convicted for suggesting that the Bible was written by someone “drunk on wine and smoking herbs” – the tolerance of such images is even more egregious. It is hard to think of anything more offensive towards a religion than falsely suggesting that its members slaughter the children of another and use their blood for ritual purposes. Moreover, by remaining in place, especially in churches, which are symbols of trust and authority in such a deeply religious country, the paintings risk lending continued credence to the blood-libel myth. Tokarska-Bakir’s findings (pp. 14, 26) are particularly telling – and worrying – in this regard. One of her interviewees comments of the cathedral’s painting that “since it hangs in a church…there must have been some truth to it”; another suggests that if the scenes depicted in the paintings “hadn’t been true, they wouldn’t be hanging there, and the church’d take some stand on it.” Others make similar observations. It is hard to find clearer testament as to the power of the images, and of the harm caused by the Church’s failure to take any action whatsoever regarding those in St Paul’s. Image from the chancel of the Church of St Paul in Sandomierz. As such, an appropriate solution would be for the painting in the cathedral, which receives far more visitors than St Paul’s, to remain in place, but with an improved plaque that explains more clearly, accurately and honestly the history behind it. The series of images in St Paul’s, however, should preferably be removed from public view entirely (in the same manner as have other, similar paintings in Polish churches, most famously in Kalwaria Zebrzydowska at the behest of the future Pope John Paul II). Whether they are covered up, put in storage or placed in a museum is an issue for the town to decide. Tokarska-Bakir’s study suggests (pp. 51-6) that, although local residents have a strong attachment to the paintings as part of the town’s heritage, there are those (albeit seemingly a minority) who accept that openly displaying them in churches is problematic, and that covering or relocating them would be acceptable. From an outsider’s perspective, it is hard to think of any reasonable justification for the continued public display in St Paul’s of such false, hateful images, which have little artistic merit and represent such a poisonous legacy, one whose tolerance damages the Church’s moral standing and is contrary to its own policies regarding Jewish-Christian dialogue. In his article, Musiał finished by reminding his fellow Catholics of the words of Stanisław Gądecki, then chairman of the Polish Episcopate’s Council for Interreligious Dialogue and today Archbishop of Poznań, who earlier that year had delivered a sermon on the Polish Church’s Day of Judaism. In it, Gądecki had criticized disingenuous “exculpatory judgments,” and promised that, where “fault was confirmed by serious historical research,” the Church would make a “request for forgiveness” as an “expression of the compelling need for truth.” As Musiał noted then – and as has been further confirmed since – historical research leaves no doubt that senior figures in the Polish Church were intimately involved in perpetuating the blood-libel myth, and in encouraging the persecution that arose from it, all of which inflicted profound physical and psychological damage on the country’s Jews. For Sandomierz’s new plaque to ignore, and even distort, these facts suggests that the Church favors “exculpatory judgments” over any “compelling need for truth.” Moreover, despite Archibishop Gądecki’s further suggestion, in response to Musiał’s article, that there should be “remorse” for “mistakes of the past,” there is no evidence of such a sentiment in the plaque. This represents a missed opportunity to come to terms with a difficult historical episode and to truly advance Jewish-Christian dialogue, which must be founded on an honest appraisal of the past, encompassing the bad as well as the good. 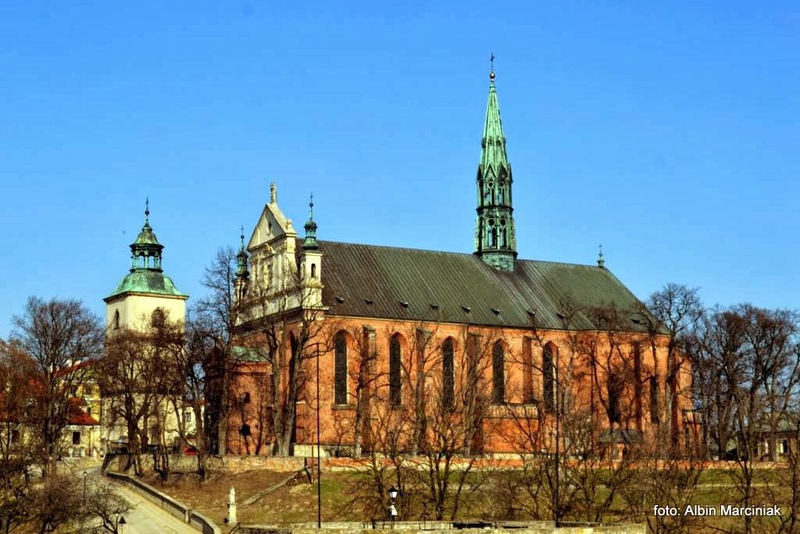 There are few better places to achieve this than Sandomierz, a town whose population was, by the early twentieth century, divided equally between Christians and Jews, and which has through its history seen the best and the worst of the relationship between those two groups in Poland. This is encapsulated perfectly in the history of the cathedral itself, where, in the very same building that houses a painting representing a period of intense suffering of Jews in the town, the descendants of those very same Jews were sheltered from the Nazis during the Second World War on the orders of the bishop, who like countless other Catholic Poles – the largest single national group honored by Yad Vashem as Righteous Among the Nations – risked his life to save theirs. Anna Sobolewska, a member of the Polish Council of Christians and Jews, suggests that “Sandomierz could become the scene of preserved memory of the centuries-long coexistence of Poles and Jews” if only it could “at long last liberate and cleanse [itself] from the odium” brought by its attachment to the blood libel. Józef Niewiadomski, a priest and scholar, has argued that “the paintings from Sandomierz – properly used – can…become the cornerstone of a new consciousness.” Events in the town this year represent an important step forward in this process; but, as long as wording of the new plaque remains inadequate, and certainly while the paintings in St Paul’s Church remain untouched and unexplained, there is a danger that, if Sandomierz represents its cornerstone, Poland’s confrontation of the darker aspects of its past, and the related progress that has been made in Polish-Jewish dialogue, is being constructed on weak foundations. The 23% statistic, though it made for good headlines in Polish and international media, should be regarded with a little skepticism. First of all, it represents a big jump from earlier figures produced by the same research organization, which in 2009 and 2011 found just 9-10% of Poles to believe that Jews had historically kidnapped Christian children. This suggests that the most recent number may be an anomaly. A more substantive concern, however, is the wording of the question (translated here into English): “In the past Jews were accused of kidnapping Christian children. Do you think that such kidnappings took place?” While a positive answer to such a question may correlate with negative feelings towards Jews, it is questionable whether it really, as the authors of the study suggest, demonstrates acceptance of the blood libel. There is a big difference between believing that at some time in history some Jews kidnapped Christian children (which is what the question effectively asks) and believing that “the Jews” did so for the purpose of murdering them and using their blood for ritual purposes. For a very relevant reflection on events in Kielce in the context of unearthing long-suppressed historical truths – however ugly some of them may be – as a means of “clearing out the lies now ingrained in the national consciousness,” see this essay by Adam Michnik. Although they are often lumped together, the set of four images relating to Sandomierz’s history (of which the ritual-murder painting is part) is distinct from a second set of twelve paintings in the cathedral that similarly depict Catholic martyrdom. The latter are separate, both physically (being placed along the sides of the church rather than the back) and in terms of their purpose (they are auguries, each labeled to represent a different month of the year, by which a visitor can, according to the date of his birth, supposedly find out how he is going to die). See Tokarska-Bakir’s report, footnotes two and three, and here. Please see the books by Magda Teter. In the middle ages there were thousands of prejudices and myths about different groups of the european society and about our planet as a whole. And Jews of course were not excluded. No need to be so sensitive about these paintings. But unfortunately this particular prejudice was not left behind in the Middle Ages. The peak of blood-libel allegations in Poland took place in the 18th century, well after the end of the Middle Ages. As late the mid-20th century accusations of ritual murder were inspiring anti-Jewish pogroms. And even today there remains a strong belief in the myth in Poland (and elsewhere). Indeed, the Kielce pogrom has its origin in the age-old Blood Libel. This was sparked as recently as 1946 by the disappearance of a Christian boy who turned up a few hours later and said he was held against his will in the cellar of the ‘Jew-House’ with other boys but he managed to escape. The police and the locals knew full- well that this house didn’t even have a cellar, before they went on their murder rampage.